Steven (Chicagoland, United States) on 4 April 2014 in Plant & Nature and Portfolio. 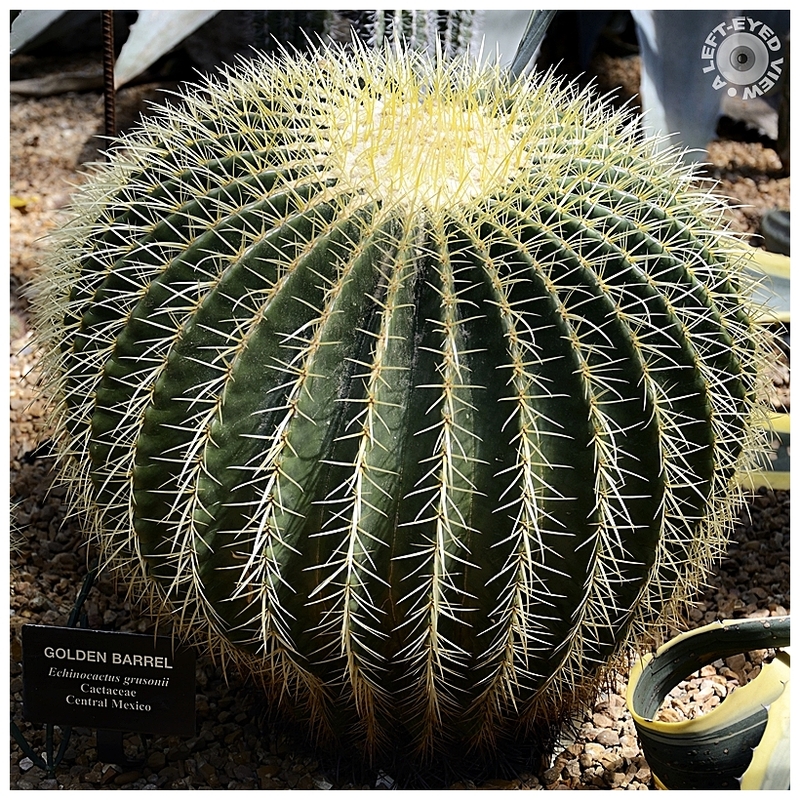 Echinocactus grusonii, popularly known as the Golden Barrel Cactus, Golden Ball or, amusingly, Mother-in-Law's Cushion, is a well-known species of cactus, and is endemic to east-central Mexico. It is rare and critically endangered in the wild, where it is found near Mesa de Léon in the state of Querétaro, and in the state of Hidalgo. The population was critically reduced in the 1990s, by the creation of the Zimapán Dam and reservoir in Hidalgo. The cactus grows in volcanic rock on slopes, at altitudes around 4,600 ft. Captured at the Garfield Park Conservatory on April 27, 2012. Looks a real bad spot to trip and fall . .
An excellent capture of this beautiful cactus. An excellent close up of this prickly looking cactus. Very well done. The pattern brings a wonderful effect. A beautiful specimen, nicely captured. That beauty is best caught with a camera and not with your hands. My wife likes this pillow ... for me :-((( It's amazing how despite the spines, Cactus can be so beautiful and with so wonderful shapes ... Superb image !!! Gorgeous close up. The detail is wonderful! I love the nickname! This is a beautiful image! Very beautiful and amazing that it is rare; great information! Very nice close-up shot with good details. Il pique ,mais il est très beau .